Have you registered your incoming kindergartener for Jump Start? It is a great way to start the school year off. 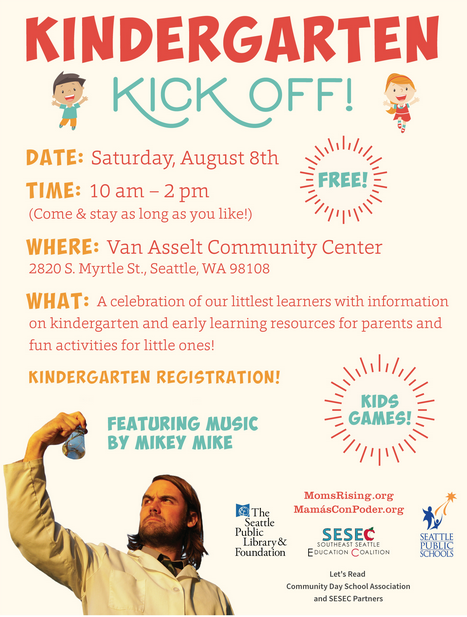 You can register your child at our upcoming Kindergarten Kick Off on Saturday, August 8 from 10-2 p.m. at Van Asselt Community Center, 2820 S. Myrtle St. Seattle Public Schools​’ enrollment staff will be on site to enroll and answer questions. Free entertainment, giveaways, and bring a friend! The flyer and details can be found here.